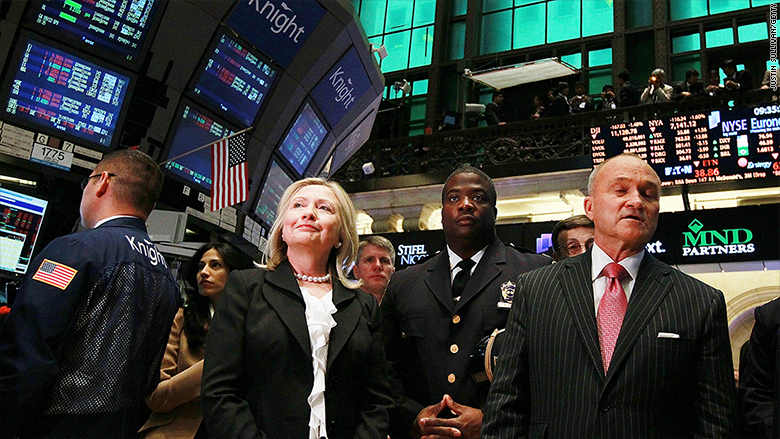 Hillary Clinton unveiled her big plan to curb the worst of Wall Street's excesses on Thursday. The reaction from the banking community was a shrug, if not relief. While Clinton proposes some harsher regulations, she stops far short of what more populist Democrats like Bernie Sanders and Elizabeth Warren want to do to Wall Street. Sanders and Warren think the big banks should be broken up. Clinton does not. It's a big divide in the Democratic party. "We continue to believe Clinton would be one of the better candidates for financial firms," wrote Jaret Seiberg of Guggenheim Partners in a note to clients analyzing her plan. Clinton's big push is for more accountability on Wall Street. But she does that by proposing a tweak to what is currently in place, not a major overhaul like Sanders. "To prevent irresponsible behavior on Wall Street from ever again devastating Main Street, we need more accountability, tougher rules and stronger enforcement," she wrote in an opinion piece for Bloomberg Thursday. 1. Go after more bad guys. Clinton would give prosecutors more time to go after banks or people for financial wrongdoing -- from five to 10 years. She would also push for bank CEOs and other top executives to have more of their bonus money paid out over time. That way those bonuses could be scaled back if bad practices come to light. 2. Tax (some) high-frequency traders. More and more trading is done by speedy computers used by high-frequency traders. There's a big debate about how helpful or harmful they are. Clinton is proposing a tax only on high-frequency traders who cancel a lot of orders -- the financial world's equivalent of a fake out. 3. Keep Dodd-Frank in place and enhance the Volcker rule. Clinton is very clear that, unlike many Republican candidates, she would keep the financial reform law known as Dodd-Frank. She would also strengthen the Volcker rule by ending a provision that allows banks to invest up to 3% of their capital in hedge funds. Clinton thinks that encourages too much risky behavior. 4. Crack down on "shadow banking." This is a term often used for hedge funds and other non-bank players in the financial world. Their influence is growing and Clinton wants to put them under more regulation. America's largest banks and financial firms would likely have to make some changes under Clinton's plans, but they have been doing that since Dodd-Frank was passed in 2009. "To us, [Clinton's] overall plan demonstrates an understanding of the financial system that we have not previously seen on the campaign trail," Seiberg wrote. Part of the reason Wall Street has some comfort with Clinton is because of her advisers. When it comes to financial issues, she has often turned to Gary Gensler, a former Commodity Futures Trading Commission chair, and former Congressman Barney Frank, the co-author of Dodd-Frank. The financial world knows both of them well. Wall Street also takes comfort because of the record of President Bill Clinton. He turned out to be very moderate on economic and financial issues, and stocks soared under his tenure. Sanders and Warren, who isn't running but casts a shadow over Democratic policies about Wall Street, argue that banks like JPMorgan Chase (JPM), Bank of America (BAC) and Citigroup (C) are still "too big too fail." Former Maryland Governor Martin O'Malley, a 2016 contender, is in their camp as well. O'Malley criticized Clinton's plan for "falling short." They think the only way to ensure those banks never need a taxpayer bailout again is to make them smaller by reinstating a law know as the Glass-Steagall Act, which Bill Clinton abolished in the 1990s when he was president. In short, the Glass-Steagall Act prevents banks from doing both Main Street type activities like lending to people for their homes and small businesses, and Wall Street type activities like trading. Having that wall in place kept banks more focused and smaller. Clinton doesn't want to bring back Glass-Steagall, but she does propose a "risk fee" on the largest financial institutions. The details are thin, but she implies that any bank with assets over $50 billion would have to pay some sort of penalty. While Clinton looks moderate compared to some of her colleagues, she is distancing herself from Republican rivals. On the GOP side, numerous candidates including Jeb Bush and Marco Rubio have said they will repeal the Dodd-Frank law because it is too harsh on banks and stifling the economy.